Home > Ask Our Experts > Maximum Temperature for a Biorb Tank? We have recently bought a heater for our biorb tank ready for when we get tropical fish. What we would like to know is what's the maximum temperature that we need to turn the heater up to, at the moment we are turning it up gradually but when should we stop? The ideal temperature for your aquarium depends on the kind of fish you want to keep in it, but there are also other factors to consider when dealing with a biorb. As a rule, the cooler your aquarium is, the easier it is to look after. It's also much easier to look after big aquariums than small ones. This is because things take longer to go wrong in a bigger ecosystem, whilst heat means that most problematic bacteria will metabolise more quickly and breed faster. Because biorbs are small, it's better to try and keep them relatively cool - around 24°C - choosing fish that are happier at this sort of temperature, such as danios, barbs or the smaller species of tetra. 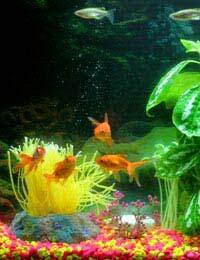 Smaller fish will be happier generally in this type of aquarium as they'll have more space to move and behave naturally. If you set up a community of different types of fish in your tank, it's important to make sure that they will all be comfortable at the same temperature. It's also important to keep the temperature stable, as changes can have a negative effect on fish health. Again, this is more difficult in a smaller tank, so you should make sure you have a good quality heater and an aquarium thermometer which you check regularly. Remember that the temperature of your tank can be affected by the overall temperature of your house. Even if your heater has a good thermostat, you should be especially careful about checking the temperature in very warm or cold weather. It's good that you're taking your time to heat up your tank as this will help you to establish a stable ecosystem. When you reach your chosen temperature, you should run the tank for another week before introducing the fish, to give everything time to stabilise. A small, warm aquarium is more vulnerable to disease, so you should pay close attention to your fishes' health and have medicines on hand to enable you to deal with problems as soon as they appear. However, if you set things up properly and are careful and attentive, you should have many years of successful fishkeeping to look forward to. How Can I Get Rid of White Flies in my FishTank?